Smucker’s Meats is a third generation meat processing company. In 1965 David Smucker purchased a small custom butcher shop in Manheim, Pa. He had spent the previous eight years working for his brother-in-law cutting meat and going to a farmers market. Now he and his family were able to focus their energies on custom cutting beef and hogs for local farmers. From the very beginning the family was a vital link in production. Martha, David’s wife, wrapped the meat to be frozen and also did all the bookkeeping. The kids would help out after school every day and as they grew up assumed more and more responsibility. That business grew steadily slaughtering approximately 20 cattle and 15 hogs weekly over the winter months. Summer was the slow time allowing the family to catch their breath and also do some traveling. In 1980 a partnership was formed between David and his son Jay. The early eighties saw a decline in custom butchering so in 1985 a market stand was purchased at Meadowbrook Farmers Market. Even though they had been in the meat business for many years, cutting meat for retail sale was a bit different. With custom it was important to cut orders to individual customer specs, in retail it needed to be cut so it would look good in the meat case in order to be appealing to customers. This was an opportunity to learn what normal retail customers were looking for and gain a better understanding of customer service. Custom work was done in the beginning of the week and retail was done on Fridays and Saturdays. When people in Manheim learned that fresh meat was available they began calling in orders to be picked up at the shop. In 1987 renovations were done at the shop to include a small retail store. Martha, David’s wife made a few shoo-fly pies to see if they would sell. Many more pies and bread were soon added. Jay experimented with a small batch of macaroni salad on a Friday and needed to make more to sell on Saturday. As they continued making more items they once again would build on their understanding of what customers are looking for. More salads were added and soon a full line of salads were part of the weekly preparations. In 1990 the move was made from Meadowbrook Market to the Lebanon Farmers Market. That market was open Thursday, Friday and Saturday, leaving Monday thru Wednesday for custom processing. A full line of fresh meat, salads and baked goods were sold at this market. David and Martha’s kids and grandkids pitched in helping to make salads, baking pies and most importantly cutting meat. Jay always liked experimenting with new items so one week he tried a batch of pork BBQ to use up some of the left over pork that didn’t sell. It soon became a mainstay in the items they sold. In 1996 Jay bought David’s share of the partnership. 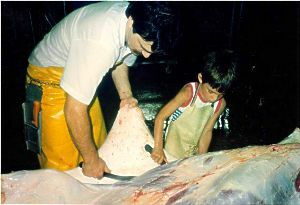 David and Martha kept working but left the managing to son Jay. Each fall deer processing was done in addition to the normal weekly activities. That segment grew to the point that no other custom work was done during the month of December. In 1997 Jay purchased his first smokehouse. Up until then all bolognas were sent out to be smoked. Very soon jerky and snack sticks were added. Deer season gave Smuckers the opportunity to hone their craft in processing. After visiting a fellow processer in western Pa it was decided to offer fermented snack sticks instead of regular because the flavor was much better. Not only could they refine their processing skills they also needed to look for ways to build efficiencies. Because of the high volume of processing that needed to be done in a short period of time becoming efficient was key. All deer meat was kept separate even in further processing. Systems needed to be developed to track and monitor each order. Variations of those same systems are used today to track and monitor all processed items. Once again what appeared to be a hurdle turned out to be helpful in the long run. In 2002 Martha passed away leaving a big void. Even though she had not been directly involved in the day to day operation she was a driving force behind the scenes. By January of 2003 sales were dropping and it was decided to discontinue all retail operations. The plan was to once again focus on custom beef and deer processing. Two days later the butcher shop was destroyed by a fire leaving the business without a place to finish processing all the deer meat that was frozen waiting for further processing. After much prayer and searching it was decided not to rebuild at the original site but rather buy an existing butcher shop in the neighboring town of Mount Joy. That plant was in disrepair because the original owner had retired a number of years before and the building was only partially being used. Renovations were begun in the spring of 2003 to bring at least some of the building up to USDA standards in order to manufacture pork BBQ for wholesale distribution. In the fall of 2003 the plant was finally ready to begin custom processing of beef and deer however it took until the spring of 2004 to gain approval from USDA to begin BBQ production. The next few years were a test of patience in many ways as the company continued fixing the building in order to also slaughter under USDA. This would allow custom customers to market and sell their own livestock. Times were lean and making ends meet was a constant struggle. What was hoped to be the answer in BBQ sales and custom processing turned out to be slow in coming. Marty, Jay’s wife, started making sales calls for pork BBQ one day a week. When she would call back to the shop saying she just signed up a customer it would bring Jay to tears knowing that each new customer strengthened the toe hold just a little more. To make matters worse the bank they had been dealing with for 30 years finally came along and said we cannot loan you any more money. In frustration Jay and Marty went to see their accountant and ask if it was time to finally throw in the towel. He had a positive outlook and helped prepare a proposal for another bank. That bank was happy to help out and in doing so helped to finally turn the corner. By the end of 2006 custom processing under USDA finally started to gain momentum. Slowly now the building that was way too big began to start filling up. Coolers that were mostly empty in the past started filling up. Where the business is today is a testament to Gods grace and His leading in spite of the difficulties. After the fire any direction was unclear and each day was a deliberate plodding, putting one foot in front of the other hoping someday the way would be clear. Looking back it’s clear to see the hand of God and how he was in fact directing those uncertain steps. A business motto is “Building a tradition of quality to leave a legacy of excellence”. The lessons learned at the small custom plant many years ago serve the company well today. David’s attention to detail and getting orders right way back then left a lasting impression on his children and grandchildren. Today employees are reminded that “quality is no mistake”. Perseverance in spite of adversity has kept the products flowing. 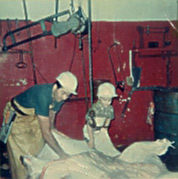 Deer processing during the winter months helped the company hone their processing skills. Today however deer meat is no longer processed due to the lack of space in the plant. Today besides the BBQ production Smucker’s Meats is a custom processer under USDA inspection. Beef, bison and hogs are the species processed allowing farmers to market their own cattle across state lines. Smucker’s caters to the niche markets such as grass fed beef, heritage hogs, and no nitrate curing and smoking. This allows customers to purchase products they feel confident in, from producers they can trust. The goal is to add value to all of the meat processed whether it is fresh meat, jerky or hotdogs. As in those first years at the small shop, creating quality products is priority. The “story” is not finished but rather continues on. One thread that is woven throughout the story is Gods grace in spite of adversity. 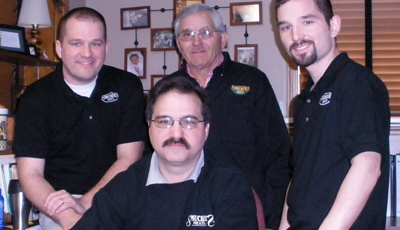 Way back in the beginning David built a business on customer service and quality products. That service and quality continue to be built, today and into the future. Building a tradition of quality…..To leave a legacy of excellence.